Halloween is the only time of the year where I can buy the cheapest, ugliest fabric from the fabric store, sloppily sew it together, add an obnoxious amount of embellishments, and people suddenly think I have created a masterpiece. Making Halloween costumes has become one of my favorite things to do each year. And although baby Liam has thus far only worn store bought or hand me down costumes, Will has had his fair share handmade Priscilla originals. And I am thankful not only during this time of year, but every day, that I married a man who will go-with-the-flow and participate in my crazy ideas. 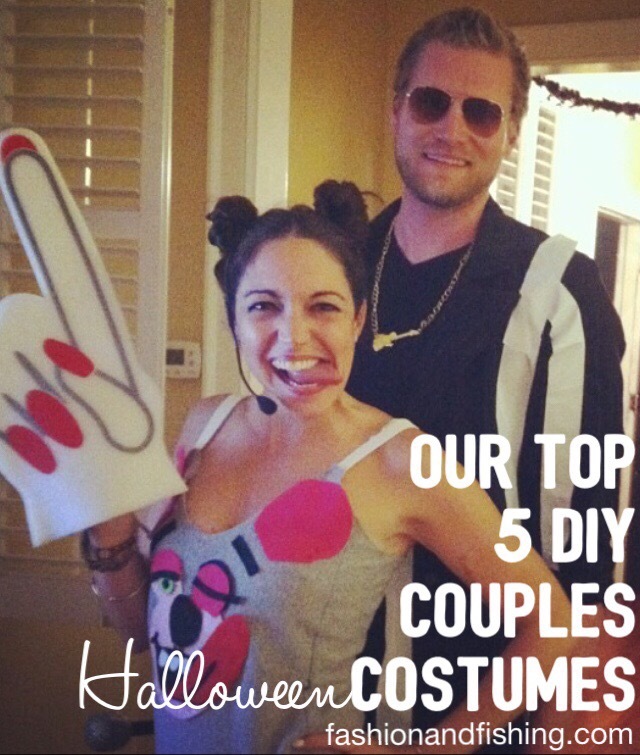 So to honor the season, here is a look back at some of out latest and greatest DIY couples costumes and a supply list in case you too want to try and embarrass your husband. 1. 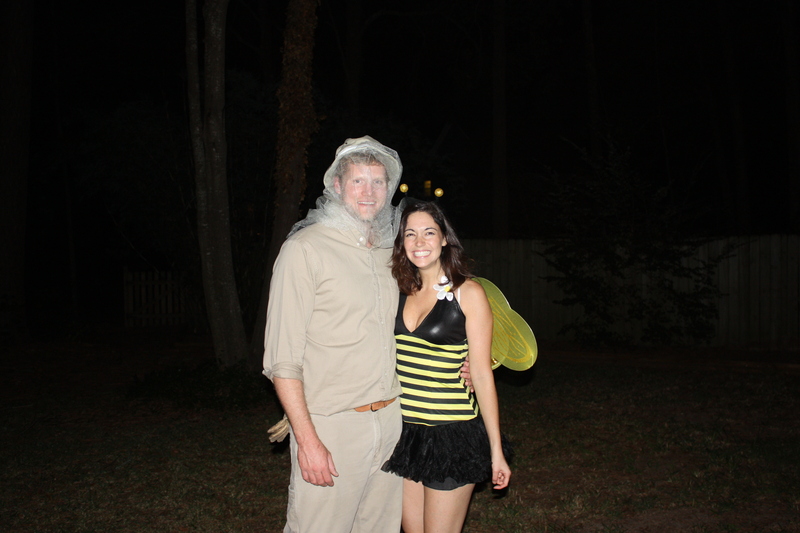 The Beekeeper and his bee (2011) SUPPLIES: For this costume, you will need khaki pants (Will is wearing Carhartt’s), a matching khaki colored button down shirt, a safari hat, and beige/tan colored tulle. I used hot glue to glue the tulle to the hat. To top off the costume, Will wore a pair of brown gardening gloves (seen here in his back pocket). For the bee suit, you could make this by adding strips of yellow duct tape to a simple black dress. But I must admit, for this year I purchased my costume. (Similar one here). I hate that I have to add a photo of the characters but, yes, there are people who are still living under a rock and do not know two of the best Game of Thrones characters. The night of our Halloween party, friends approached us and either said “dude, this is awesome!” or “wait, who are you supposed to be?” But when Will and I started watching the show, we immediately knew this was Halloween costume potential. SUPPLIES: For Drogo, Will wore (yet again) a pair of khaki pants, brown boots, and fake leather fabric stripes that I velcro’ed into a make-shift chest plate-thing. Pair with a long black wig (I bought a cheap witch’s wig from Walmart), black eye makeup, and blue face paint for the chest tattoos. For Daenerys, I wore an old brown knit skirt that I hemmed midi length and sewed up a burlap halter top with braided straps. Just add a long plantium wig. But of course, don’t forget your dragons. 3. Miley Cyrus and Robin Thicke’s VMA Performance (2013) This costume was the most “current events” costume we have ever had. 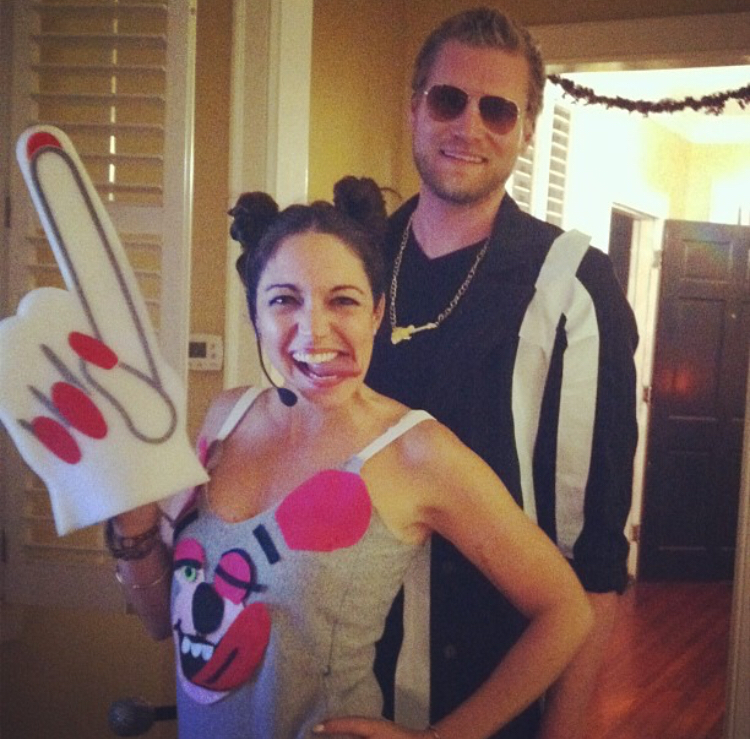 And now, four years later, I still see people dressing up as Miley and Robin’s infamous VMA Performance. Every year around this time, I have friends call me to say “hey I saw your old halloween picture on Pinterest.” It seems as though this particular costume made quiet an impact. 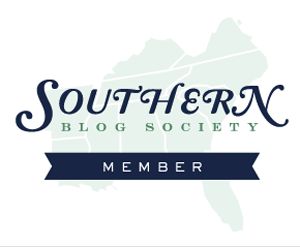 Here is a link to PopSugar’s article from this year that included our photo! SUPPLIES: For Robin, we used white duct tape to make the stripes on a back suit, with a black tee pair underneath, microphone, and guitar necklace. I bought some cheap silver, glittery jersey knit and contracted a leotard. I then used felt to create the face, ears, and straps. Don’t forget your fingers and your twerking abilities. 4. 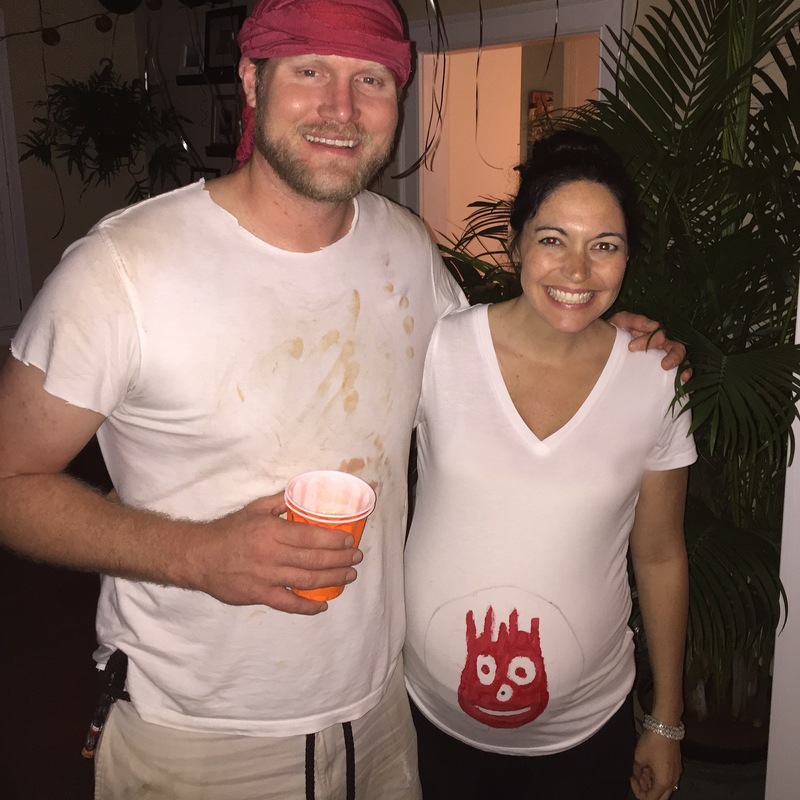 Tom Hanks and Wilson from Castaway (2015): I was very pregnant this year and we had just landed back in town from a week in California so this is what my last minute pregnancy brain could come up with. I do love how it turned out and I loved being able to include the baby bump but in a not creepy way. SUPPLIES: My shirt was pretty easy, I printed a photo off the computer and used fabric pain to mimic the design onto a plain white tee. Will wore his dirtiest pair of gardening shorts, an old white tee (which he gave me permission to throw mud and dirt all over), and a red bandana on his head. Bonus points if you can grow a really long, gnarly beard in preparation.